1 kg octopus, the tentacles only. Wash the octopus very well. Cut off the octopus tentacles; wrap them tight in cling film as if you were making a sausage, keeping it as straight as you can; place in the freezer for two hours. Reserve the remaining parts of the octopus in the freezer to use at a later time in some other recipe. Take the wrapped tentacles out of the freezer and remove the cling film; using a very sharp knife, thinly slice the tentacles. Place the octopus slices in a large bowl. Add the olive oil, wine, apple cider balsamic cream with stevia*, onion, zest and juice of the lemon; stir gently to combine the ingredients. Cover the bowl and refrigerate for 1-2 hours to marinate the octopus. In the meanwhile, in a bowl add the olive oil, apple cider balsamic cream with stevia*, garlic, mixed peppers, zest and juice of the lemon; mix thoroughly and leave aside. 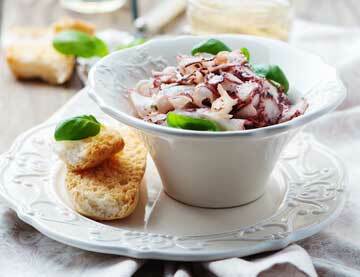 Bring the octopus out of the refrigerator, remove it from the marinade and lay out on a serving platter. Drizzle with the dressing; garnish with basil leaves and serve.